Starting the new year off with some gratuitous self promotion and trying to kick start this blog back into gear. 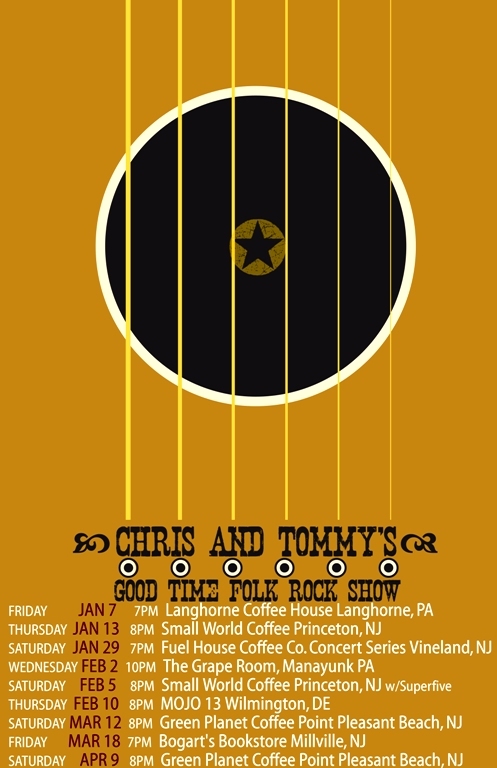 Here are the early 2011 tour dates for Chris And Tommys’s Good Time Folk Rock Show, an acoustic duo featuring Chris Nickey on guitar and vocals, and myself on bass. Come on out and join in the fun as we start off 2011 by providing the soundtrack to the First Friday Arts on The Avenue celebration at Langhorne Coffee House. To give you a taste of what it’s all about, give a listen to this set we performed this past summer at the R.A.T. Gallery in Gardenville, PA.